After school tennis at MS 126 played at the East River Tennis Courts. Sophie Gerson Healthy Youth (SGHY) brought New York Junior Tennis and Learning (NYJTL), their coaches and full program to the South Bronx and to Lower East Side this year. Working with teachers, NYJTL conducted an after school tennis program during the Spring semester. The program gave the students tennis rackets and three days a week of instruction with professional tennis players. 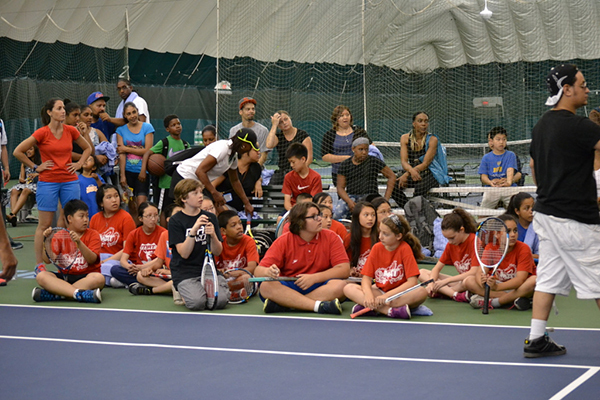 The students loved the program and learned not only how to play tennis, but how to persevere through challenges. Tennis is not an easy sport to learn, but the students were dedicated and kept trying their best. Even when there wasn’t practice, they were practicing against the wall or would stay after tennis instruction to play more. It gave them a sense of purpose and a goal to reach to the next level. Tagged Healthy Youth, MS 126, New York Junior Tennis and Learning, NYJTL, Tennis.